Director Pedro Almodóvar excels at finding ways of putting desire, agonizing unrequited love, and purely impure horniness on a movie screen. He remembers, in film after film, what many of us, once hurt, would like to forget: those times when you’ve loved someone so intensely it seems as though your chest will burst; when the mere sight of the person you’re obsessed with makes you shake inside; when those feelings erupt in ways that doom or explode whatever relationship you may be trying to nurture. The Oscar-winning Spanish filmmaker’s new movie, Bad Education, takes the notion of falling in love with the “wrong” person to a new, delirious extreme. It begins in 1980 Madrid, as Enrique (Fele Martínez), a successful young director, searches for a subject for his next film. Into his production office strides a handsome fellow who says he’s Enrique’s old school chum, Ignacio, he’s now an actor, and he’s written a semiautobiographical tale that would make a good starring vehicle for himself. Skeptical, Enrique reads Ignacio’s story, which is about a period in Enrique’s life when, in Catholic school, he and Ignacio were 10-year-old boys in love with each other and how Ignacio was molested by a priest, Father Manolo (Daniel Giménez-Cacho). Ignacio’s story then jumps forward, to a time when he’s transformed himself into Zahara, a drug-addict transvestite who confronts Manolo. Intrigued—jeez, Louise, who wouldn’t be?—Enrique decides to make this movie, but he doesn’t want to cast Ignacio as Zahara, saying his friend is too masculine-looking for the role. This leads to tension between the two, even as their youthful attraction to each other is reignited. As Enrique pursues the project, he discovers the seeming Ignacio is actually Ignacio’s brother, Juan (Juan/Zahara is played by Gael García Bernal), and Bad Education takes a turn—heck, takes many turns—I’m not willing to reveal, because following the twists is actually what the movie is about: the wrenching twists life takes. Having won Oscars for All About My Mother (2000) and Talk to Her (2003), Almodóvar may be becoming a bit too self-conscious for his own good—too aware of his world-cinema rep as, in the words of a profile in the New York Times recently hyped him, “the most original and daring filmmaker working today.” Oh, pish-tosh: Almodóvar is best when he’s being gleefully disreputable—eager to play the filmmaker-clown, to encourage his actors to give go-for-broke, often absurdist performances, never minding that you notice whom he’s thieving from. In earlier movies like What Have I Done to Deserve This? (1984) and Women on the Verge of a Nervous Breakdown (1988), Almodóvar achieved surrealist farce, part Luis Buñuel, part Jean-Luc Godard. He is, in Godard’s familiar phrase, a child of Marx and Coca-Cola: contradictory, a trickster, drunk on the use of the bright colors and cultural contradictions of commercial filmmaking. Bad Education, however, finds Almodóvar trying too hard to be sober. He has two of his protagonists go to a movie theater featuring “Film Noir Week,” and one of them says portentously, “It’s as if all the movies were talking about us.” When Almodóvar wants to suggest how childhood molestation affected one of the boys—disassociated the poor kid’s personality—he has a thick line of crimson-red blood run down the center of the youth’s face, and then splits that face in two. But in contrast to such heavy-handedness, Bad Education also does some truly daring things, not least of which is to make the criminal priest a sympathetic character. Or at least, sympathetic by Almodóvar standards, in that the bedeviled man of shaky faith is driven by sincere passion, suffers for it, and then continues to pursue that passion for the rest of a perfectly miserable life. The wretch takes on a kind of dragged-through-the-gutter beatification. It’s no wonder the director has referred to Bad Education as his “anti–Mel Gibson movie”: Almodóvar, a lapsed Catholic, suggests that Christ’s mercy must extend to his most flamboyant sinners. 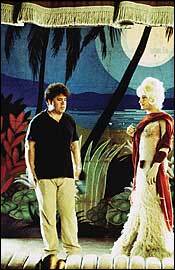 And Almodóvar sure knows from flamboyance. He gets a lushly layered performance from Bernal, who can’t just float through these proceedings looking alluring, as he did in the pretty but flat The Motorcycle Diaries. Fele Martínez is equally good: He’s slyly funny in the beginning, copping a pose of wan hipness to disguise Enrique’s quiet desperation to maintain his status as a hot director who hasn’t got a clue what his next hit should be. Then Martinez dives deeper into the character—dropping the pose—the more Enrique uncovers about Ignacio and Juan. Bad Education may be at once too gimmicky and too sincere. But it still exerts an uncanny power: Like the best of Almodóvar’s work, it throws you a first-love sucker punch that will stagger your heart, mind, and soul. So far, 27-year-old Mexican actor Gael García Bernal has starred in four of the most high-profile Spanish-language films of the past five years (Amores Perros, Y Tu Mamá También, The Motorcycle Diaries, and Bad Education). Now Natalie Portman’s ex is set to conquer English-language movies—at least the interesting ones. Smartly avoiding typecasting, he’s wrapped The King, the feature debut by sharp, weird director James Marsh, playing a disturbed ex-Marine who reunites with his Texan father. Next up, he’ll play a man tormented by dreams in The Science of Sleep, for Eternal Sunshine director Michel Gondry. Sony Pictures Classics. Not Yet Rated.